Approximately 1,300 years ago, (during the 6th century A.D.) the Korean peninsula was divided into three kingdoms: Silla, Koguryo and Baek Je. Silla, the smallest of these kingdoms, was constantly under invasions and harassment by its two more powerful northern and western neighbors. During the reign of Chin Heung, 24th King of Silla, the young aristocrats and warrior corps formed an elite officer corps called Hwa Rang-Do. This warrior corps, in addition to the ordinary training in spear, bow, sword and hook, also trained themselves by practicing mental and physical discipline and various forms of hand and foot fighting. To harden their bodies, they climbed rugged mountains, swarm the turbulent rivers in the coldest months and drove themselves unmercifully to prepare for the task of defending their homeland. To guide themselves and give purpose to their knighthood, they incorporated a five-point code of conduct set forth by their country’s greatest Buddhist monk and scholar, Won Kang. Be loyal to your king. Be honorable to your friends. Soo Bak was popular among the common people in Koguryo. The people had a high regard for Soo Bak. During the Dan-O festivals (May 5 of the lunar calendar) and mid-Autumn festivals (August 15 of the lunar calendar), competition of Soo Bak was held along with games of Korean wrestling, tug of war, Taek Kyon, hopping contests and Jeki Chagi. It appears that the warriors of Hwa Rang-Do added a new dimension to this national art of foot fighting by gearing it to a combative art and infusing the principles of the Hwa Rang-Do. The new mental concept as well as physical elevated foot fighting to an art and it became Soo Bak-Gi. The famous Korean historian, Dr. Danje Shin Chae Ho, in his writing of ancient Chosun, describes contests of skill and courage under grueling conditions: “Dancing with swords and certain water sports were held on the frozen river to test a contestant’s courage. Archery and Taek Kyon contests were held to test skill and strength. The winner of the hunt was given the title of Son-Bi. All the above were judged to be necessary prerequisites of the warrior, and winners were held in esteem by all.” Dr. Danje further states that the art of Soo Bak was eventually introduced to China as Kwon Bup and as a form of Jujitsu to Japan. While pursuing historical documents relating to the martial arts in Korea, it was interesting to discover that the third king of the Yi Dynasty (1401-1408) actively recruited experts in Taek Kyon, Sirum (Korean wrestling), stone throwing, archery and Soo Bak Gi to help in organizing a strong army. Much historical documentation seems to indicate that some of these forms of open hand fighting may have been eventually exported to Japan and formed the basis for Japanese Jujitsu and Karate. The Korean Hwa Rang-Do may have been the forerunners of the famed Japanese Samurai. In his book, “This is Karate”, Masutatsu Oyama, a well-known authority of Karate in Japan, mentions that the etymology of Kara refers to the kingdom of Karak at the southern tip of the Korean peninsula, where their types of open hand fighting may have been brought to Japan by these ancestors of the Japanese people. In another interesting study, Dr. An Ja Sun has stated in his book of ancient Korea, “Chosun Moo Sa Yongoong Jun”, the biography of Korean warriors, the Yoo Sul school (which could now be considered Jujitsu) was known under the name of Soo Bak-Gi or Taek Kyon. Annually during the month of May, the King of Chosun held a match of this form of unarmed combat at Kak Chon Pavilion on Ma Am mountain. The winner of this contest was awarded a prestigious government post. The king also made the contest compulsory for all soldiers. Three of the winners of this annual contest Lee Yi Min, Jang Joon Boo and Sa Kyang Sung eventually became leading generals during the Koryo Dynasty. It appears that the king held more than a passing interest in the art. There was 25 fundamental movements or postures used by the practitioners. These postures incorporated hand, leg, jumping, falling, rolling and pulling techniques. Certainly the Silla and Koryo marked a flowering of anti-military posture. Though this began a period of civil enlightenment, the martial arts appeared to have ceased existing. The final blow came with the Japanese occupation (1909-1945), when it was forbidden to practice any of the martial arts. Taek Kyon was secretly practiced by some dedicated stalwarts and passed on to a handful of students. Proponents of the art, such as Song Duk Ki and Han Il Dong, managed to keep the art alive. With the liberation of Korea in 1945, the new Republic of Korea Armed Forces was organized on January 15, 1946. A young second lieutenant, Choi Hong Hi, recently released from a Japanese prison camp, began teaching his martial arts to some of his soldiers. The rest, of course, is history, resulting in what is known throughout the world as Tae Kwon-Do. In 1955, the name of Tae Kwon-Do was chosen as the new name of the national martial art by a board of instructors, historians and other prominent persons. The name was selected for its apt description of the art: Tae (foot), Kwon (fist), Do (art). Not only did this new name bear a close similarity to the ancient name of Taek Kyon, but the name gave new sense of nationalism to the art, whereas the prevalent names of Dan Soo connoted Chinese hand. 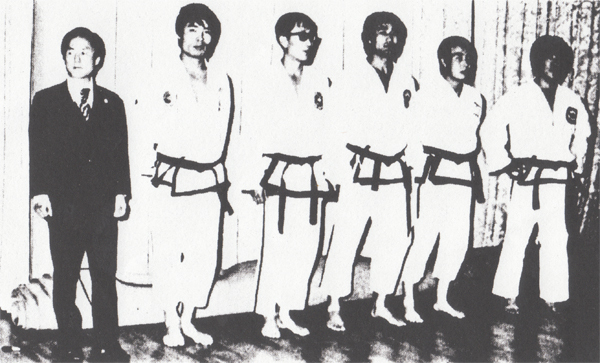 The years of research and development by General Choi resulted in the Change Hun style (pen name of the author) of Tae Kwon-Do. Though this style is primarily based on Taek Kyon, Soo Bak and Karate techniques, a myriad of techniques have been added, especially in the variety of hand techniques and perfection of foot techniques. The Chang Hun style is based on 24 patterns, each perfected and polished by General Choi Hong He and his colleagues, from the white belt pattern, Chon-ji, to the highest one, Tong Il. After 1,300 years, a Korean martial art has reached full maturity and has spread from a small band of aristocratic warriors to practitioners in more than 60 countries with millions of students. The combination of the old classical techniques and new modifications have resulted in a form of self-defense and mental conditioning unrivaled in the modern world.